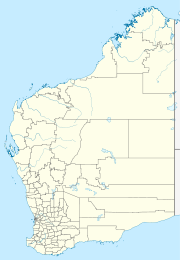 Kutkabubba is a small Aboriginal community, located 40 km north of Wiluna, Western Australia in the Mid West, within the Shire of Wiluna. The community is located within the Wiluna (WAD6164/98) Native Title claim area. The community is managed through its incorporated body, Kutkabubba Aboriginal Corporation (formally Kukabubba Aboriginal Corporation), incorporated under the Corporations (Aboriginal and Torres Strait Islander) Act 2006 on 16 November 1994. Kutkabubba Layout Plan No.1 has been prepared in accordance with State Planning Policy 3.2 Aboriginal Settlements. Layout Plan No.1 is yet to be endorsed by the community. This page was last edited on 14 December 2018, at 16:32 (UTC).